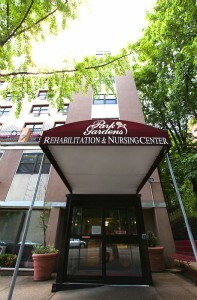 Park Gardens Rehabilitation and Nursing Center is a 200-bed skilled nursing facility located in the beautiful Riverdale section of the Bronx. We offer around the clock nursing care, an array of medical services, and a comprehensive variety of restorative therapies. Each therapy programs performed by our highly skilled staff, and is tailored to address each person’s individual needs. Additionally, Park Gardens offers a variety of recreational programs to help maintain everyone’s quality of life during their stay. We strive to provide an atmosphere of warmth, hospitality, and quality care. We at Park Gardens recognize that if a patient can’t be home, we need to do our best to make them feel at home during their stay. Park Gardens Rehabilitation and Nursing Center is approved for Medicare and Medicaid. Our convenient, Riverdale location is easily accessible from Manhattan, Queens, and Westchester.